Lower back pain is one of the most common reasons that people seek the help of our Acupuncture Team in Oakville – 80% of people will experience it at some point in their life. Lower back pain is always a nuisance and can really affect our ability to carry on our daily activities. Getting adjusted and muscle release can really improve lower back pain – but have you tried acupuncture for low back pain? For people experiencing that dull, achy muscle pain in the lower back, acupuncture can really be a life saver! 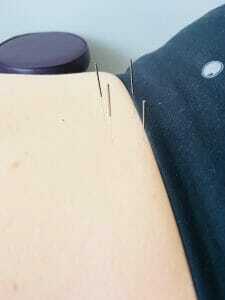 The acupuncture needles are inserted along the spine to affect the nerves as they exit the spinal cord. These nerves innervate the muscles of the lower back and glutes, which often contribute to lower back pain. This sounds scary but it really isn’t. By targeting the nerves as they leave the spinal cord we can actually have an effect on areas much further away from the spine, even as far as the feet. Acupuncture is one of the only conservative treatments that have such a big impact on the nerves and our nerves are what carry our pain signals and activate our muscles! Inserting needles into the glutes is an amazing way to release muscle tension and decrease pain. Oftentimes, weak glute muscles can exacerbate back pain and acupuncture can also help that issue! Acupuncture can stimulate and ‘wake-up’ the nerves, leading to more effective muscle activation, decreased pain and less dysfunction of the lower back and pelvis. Whether the muscles are too tight or too weak, acupuncture can help. How amazing is that!? Back pain can be caused by small joints in the back that are stuck or stiff. The nerves of the spine cross in very close proximity to these joints, so a stuck joint can also impact the nerves in the area. Acupuncture treatments to those areas can help decrease the sensitivity of the pain causing structures (the joint) and decrease the resulting inflammation around the nerves. This leads to a decrease in pain for you!